Well, I decided I would try to do some work on freezer paper because it was bigger than anything else I had. 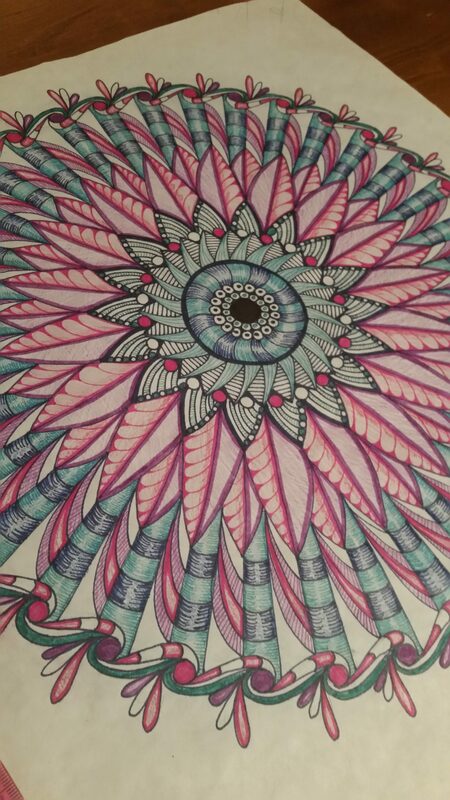 So here is my mandala on an 18×18 sheet of freezer paper. I thought that using freezer paper would be ideal because I knew it wouldn’t bleed through and I could really test my skills. These colors all went together so well. Here is a closer look at some of the details. Update: You can find this mandala linked in on 100.mandalas.com, where I have received so much inspiration from her book, as well as attending mandalafest every year! Please check it out!